Publiziert am 6. Januar 2013 von S.S.o.C.A. Uns erreichte die Anfrage zu einer interessanten Geocoin aus dem Jahre 2008. Die Dala Horse Geocoin wurde seinerzeit von mousekekat aus Schweden entworfen und über Castle Coins & Pins vertrieben. Hierzu wurden folgende Infos veröffentlicht: „I don’t think that the soldiers and farmers in the Dalarna area of Sweden ever thought that the simple children’s play thing made from their wood scraps would some day be such a world recognized icon for Sweden !Although today’s representation of the Dala Horse only goes back about 150 years, there are records of the first Dala Horses being made and sold almost 400 years ago! 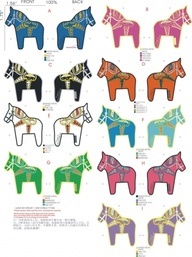 The style of painting on today’s horses goes back to the 19th century, where Stickå-Erik Hansson from Mora introduced the technique of painting with 2 colors on the same brush, which is still used today. What started out as a child’s toy became, in the 1800’s, a method for households to actually earn money and the little horses actually became a barter item when the economic hardship of the 1800’s grew. Making and painting Dala Horses became a family art and craft, passed down from one generation to the next. The painting styles actually became very distinctive and could trace a horse back to the family who made it. Dala Horses made for sale today in Sweden are still hand painted and hand carved. The wood for them is pine and the trees for Dala Horses are chosen while still standing in the forests, using only high quality wood. Because they are all hand made, no two horses will ever be exactly alike! Naomi “mousekekat” hand drew the design for our Dala Horse Geocoins using actual models of Dala Horses from her adopted homeland of Sweden . We selected a wide array of traditional colorings and some not so traditional colorings for these incredible designs. 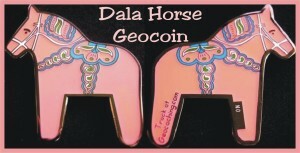 Each Dala Horse Geocoin is very unique in its own way yet we kept the patterns crisp to reflect the traditional design. We have minted 9 Editions in total listed below with 5 editions being (30 ONLY Special Limited Editions). These particular 5 editions will NEVER be re-minted and will be limited to one each per household as we want the collectible value to remain at its highest. Two Editions (Traditional Red/Orange and Traditional Blue) will be available as open stock (75 minted of each in this initial minting) and Two Editions (Black Glitter and White Pearl Glitter) will be classified as limited stock (50 minted of each in the initial minting and only a maximum of 50 additional if there is a demand). 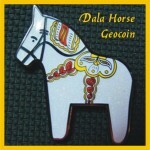 Each geocoin is trackable on geocaching.com with a unique icon (A Dala Horse). Die Dala Horse Geocoin erschien am 16. Mai 2008 bei CastleCoinsandPins.com und war innerhalb kürzester Zeit ausverkauft und ist mittlerweise ein begehrtes Sammlerstück geworden. Dieser Beitrag wurde unter Geocoin veröffentlicht. Setze ein Lesezeichen auf den Permalink. danke für Euren umfassenden, kompetenten und schnellen Bericht zu meiner Anfrage. Klasse Arbeit. Bei dieser Qualität macht die Seite absolut Sinn und ich werde sie sehr gerne im Auge behalten.